In this series I explain how to use Mythril Classic to find and exploit security bugs in Ethereum smart contracts. The articles will cover basic principles and advanced techniques, such as testing security properties, proving invariants, analyzing multi-contract systems and auto-looting ETH from vulnerable contracts on the Ethereum network. Mythril Classic — also known as the “Swiss army knife of smart contract security” — has lots of bells and whistles, but to use it effectively you need a basic understanding of the analysis techniques used. This article provides an overview of the most important concepts. The first key step we usually recommend to new users is installing Mythril Classic. You should do this also in case you to want follow the examples in this article (if run into trouble installing, you can ask for help in our Discord support channel). This command runs a generic analysis that works reasonably well in most situations. Before we get ahead of ourselves though, let’s have a look at what is going on behind the scenes. Whenever an undesirable states is encountered (such as “the contract kills itself”), logically prove or disprove the reachability of those states given certain assumptions (e.g. “given the right inputs anybody can kill the contract“). Vulnerabilities are reliably detected irrespective of their cause(s) (which could, for example, involve uninitialized state variables, integer overflows or exposed initialization functions) provided they are reachable within n transactions. We can compute the input transactions required to reach the vulnerable states detected. This is useful not only to to determine the root cause of an issue, but also for auto-creating exploit transactions should one be so inclined. Note the use of the -m argument which accepts a comma-separated list of analysis modules to execute. Let’s have a closer look at a particularly useful module called Ether Thief. The amount of ETH withdrawn can be greater than the total amount previously paid into the contract by the same sender. Users other than the contract creator can withdraw ETH from the contract account without previously having sent any ETH to it. This is likely to be vulnerability. Myhril claims that to have found an issue in the withdrawal function but the root cause is not immediately apparent. If you haven’t spotted the bug yet, take another good look at the code and try to figure out the attack. PRICE_PER_TOKEN is set to 1 Ether which corresponds to 1e18 wei. As it turns out, multiplying this amount with the value Mythril has computed fornumTokensresults in an integer overflow. More specifically, the result of the binary multiplication uint256(1e18) * uint256(numTokens) is zero — note that there are other input values that could be used here. 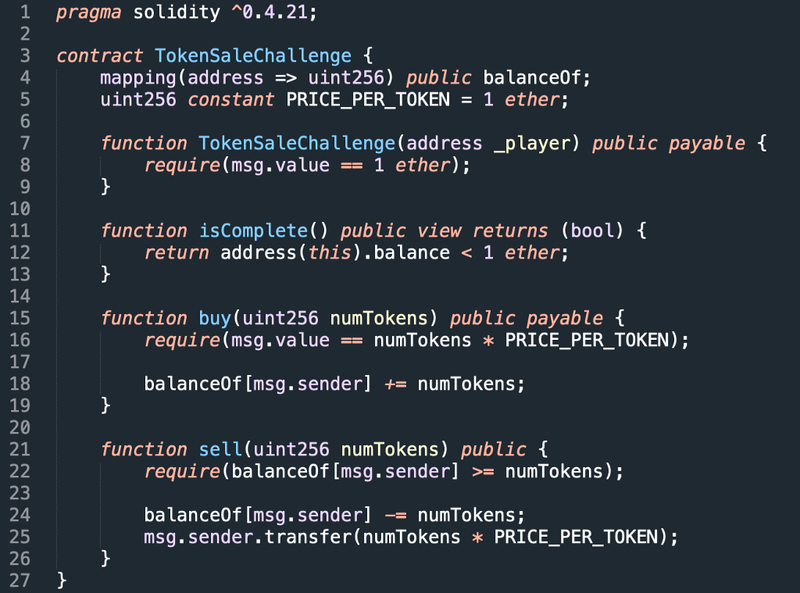 The require statement therefore passes and a large amount of tokens is credited on the sender’s account even though they’re not sending any ETH. In transaction two, the illegitimate tokens are then sold in return for ETH (call to sell(uint256)). Because Mythril represents the contract balance symbolically it outputs some large value for numTokens. In reality, the attacker would pass a lower value corresponding to the actual number of ETH in the account. If you haven’t done so already, now is the time to fire up Metamask and give the challenge a shot. An important concept to know when using Mythril Classic is transaction count. This variable specifies the number of transactions to be executed symbolically. The default value of two is sufficient for detecting many common bugs such as the integer overflows, uninitialized storage variables and misnamed constructors. However, a search that goes two transactions deep will not discover bugs that need three or more transactions to reach. Unfortunately, because each transaction can have multiple valid final states, the space of states to explore grows exponentially with the number of transactions. Symbolically executing three transactions therefore takes significantly longer than executing two (we’re currently working on a way of optimizing the number of transactions executed within a predefined timeframe — I’ll update this article as soon as this becomes available). This contract has a “backdoor” in it that allows anyone knowing the secret password to take it over (but as we know, private state variables aren’t really secret — the only difference is that the solc doesn’t generate an accessor function for them). Mythril appears to overlook the vulnerability. 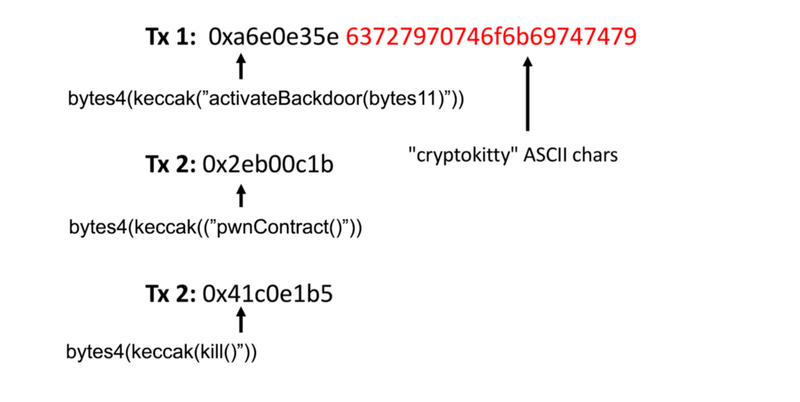 The reason for this is that a minimum of three transactions is needed to kill the contract: The sender must provide the correct password to activatePassword(bytes11 password), call pwnContract() to become the owner, and finally call kill() to trigger the suicide. A reachable SUICIDE instruction was detected. The remaining Ether is sent to the caller's address. Mythril Classic’s Ether Thief and Suicide modules detect security bugs that allow attackers to steal from, and even kill, poor innocent smart contracts. When the–verbose-report flag is added, Mythril will output the input transaction(s) needed to trigger each bug detected. Increasing transaction count helps Mythril detect more bugs but also increases execution time exponentially. Part 2 is probably coming soon. Join our growing Discord community to stay up-to-date, get support and discuss things related to Ethereum security. 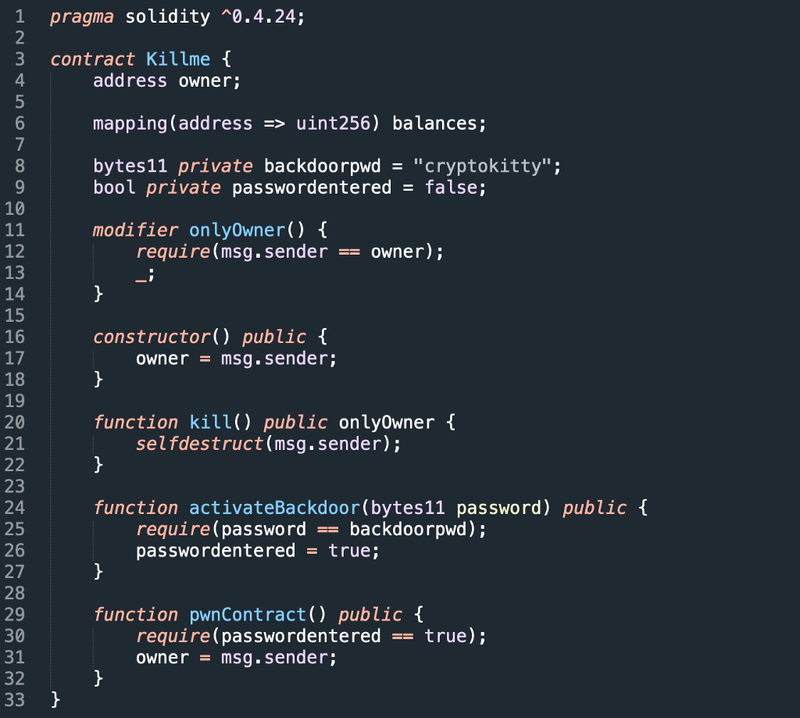 Practical Smart Contract Security Analysis and Exploitation— Part 1 was originally published in Hacker Noon on Medium, where people are continuing the conversation by highlighting and responding to this story.